Amidst all the hubbub about high power prices in Germany, Craig Morris says we have lost sight of the difference between prices and costs. What matters most to consumers, he says, is power bills. A recent article in the BBC illustrated the confusion between prices and costs well. Entitled “Energy bills: who pays the most in Europe?” it investigated only prices, not bills, which are a combination of the unit price (generally, a kilowatt-hour) and the number of units consumed (along with a flat monthly connection fee in most cases). Indeed, the entire report is based on the Household Energy Price Index (not “cost”, which is what we would need in order to talk about “bills”) created by VaaseETT, an energy think tank. Berlin turned out to be the most expensive of the 23 European cities in terms of electricity prices, but the question is whether Berliners also pay higher energy bills. While the BBC does not say so, two of its charts do indicate that Germany is in a group with practically every other Western EU country in having less than 10 percent of its population unable to pay monthly utility bills (power and heat). Comparisons of power bills are hard to find, and measurements of “energy poverty” are even harder. I recently estimated that the average German power bill would come in 16th if Germany were a US state, making German power bills relatively expensive, but certainly not much more expensive than what Americans are already used to. Sticking with the US, a recent article estimated that “low-income residents spend 12 percent of their annual income on utility bills – four times the amount that the average American spends,” but those expenses are not just for power – and the Energiewende has made electricity more expensive, not heat. The average German household spent only 2.2 percent of its income on electricity in 2011, but comparisons are difficult – expenses on heat are subsumed here under the category of “residential, gas, and other fuels (28.3 percent).” Retail power rates have also risen since 2011, though only marginally faster than the inflation rate. 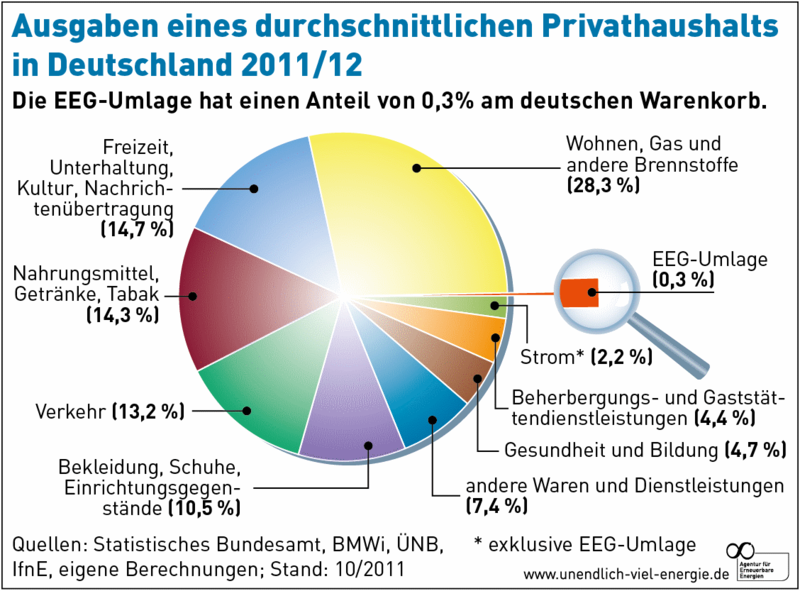 Overall, it seems that Germans spend roughly the same share of their income on utility bills as Americans do, for instance. In a way, we have the opposite of the “rebound effect” from efficiency. If you go out and buy a car with gas mileage twice as good as your old one, you can cut your gas consumption in half – or you can drive twice as much on the same amount. Efficiency gains therefore do not always reduce consumption. Since 1999, when Germany introduced its environmental taxation, the Germans have taken the opposite approach: incentivize efficiency and conservation by raising prices. It worked for motor fuels a decade ago, and it’s working for electricity now. A funny thing about Germany is that when I lived there a few years ago I found it impossible to buy mains outlets with an integrated switch. In the UK, single and dual outlet wall sockets mostly have a switch for each socket. In Germany you have to buy an ugly extra switch that is plugged in between the socket and the appliance. Why? Morris is entirely correct that the relevant social issue is how big the electricity BILL is for each household, not the electricity price. The press should make this clear in its articles on electricity prices, and they should get the bill data from the utilities, which should not be difficult if the utilities cooperate. If the German government and utilities would foster more vigorous electricity efficiency improvement programs for households, they could probably drive the average electricity bill down substantially, although not as much as such programs could do in the United States, since people waste much more electricity there. Next PostHappy holidays from the depths of Germany’s “winter gap”!